The Hennig Preserve, located just outside of the Adirondack Park, is Saratoga PLAN’s largest nature preserve, boasting ~ 606 conserved acres of land with approximately 10 miles of trails riddled throughout. 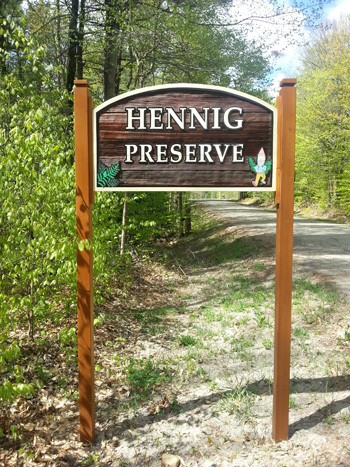 The Hennig Preserve was generously donated to Saratoga PLAN by the Hennig family in the fall of 2010. Bob Hennig, Penny Steffen, Barbara Hennig and the late Mally Sue Bleikamp Hennig lovingly cared for this land for over 50 years and accumulated the acreage that would become this preserve in many stages. Prior to their ownership, this land was used primarily for subsistence farming, logging, charcoal-making and maple syrup production, among other things. Saratoga PLAN manages the property as a natural area for native forest and wetland flora and fauna. It is open to the public for passive recreation such as hiking and walking, cross-country skiing, snowshoeing, and nature study. A conservation easement placed in 2002 on the preserve, as well as on an additional 140 adjacent acres, prevents all other uses. The Hennig Preserve relies on the continued efforts of its dedicated volunteers to steward this land and maintain the vision of the Hennig family. The volunteers at the Hennig Preserve have scouted out the best trail locations, and have laid out and marked trails through lush forests with views of beaver meadows, creeks, and ponds. 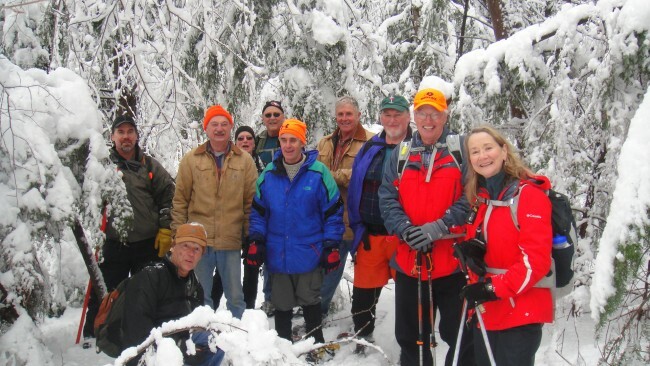 The Hennig volunteer group has also worked with Saratoga County to integrate 476 acres of contiguous county forestland into the trail network. Thanks to the dedicated help of our volunteers and Skidmore College, Saratoga PLAN’s project at the Hennig Preserve has accumulated information on a number of unique historical and geological features such as cellar holes, wells, charcoal-making pits, and esker (ridge) formations. Use the interpretive methods developed at the Hennig Preserve as a model that can be implemented at other PLAN properties, and serve as a foundation for enhancing Saratoga PLAN’s community engagement programming in general. Click here for the Hennig Preserve story map. From Saratoga Springs, take Route 29 west for 12 miles to Barkersville Road (You should see the Waterwheel Village Store on the far right corner). Turn right here and stay on Barkersville Road for 2.7 miles. The road will take several sharp turns, but stay on Barkersville Road (Route 16) until it intersects with Glenwild Road. Turn left on Glenwild Road, and after driving 1.4 miles, turn right on Centerline Road. In approximately 0.5 miles, you will see the parking area for the Hennig Preserve on the right side of Centerline Road. Trail heads are located on both sides of Centerline Road and the parking area. The volunteers that care for the Hennig Preserve meet up almost every Monday throughout the year to help ensure that the preserve’s trails are always in great shape for visitors!